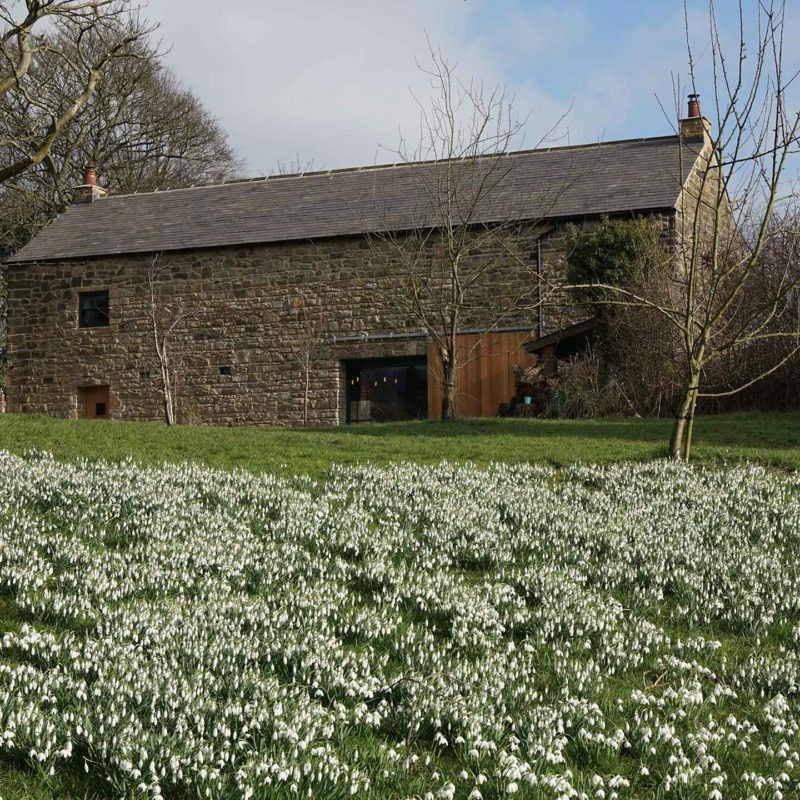 The project at Orchard Barn makes limited interventions to restore and celebrate a derelict agricultural building. After standing empty for many years, Orchard Barn was at risk of being lost; the roof had partially collapsed, and major structural deterioration had developed to an external wall. The brief was to bring the building back into use as a workshop, whilst preserving its existing fabric wherever possible. Sympathetic and restrained interventions mean that much of the character is retained and enhanced. The failing wall to the orchard was partially taken down and rebuilt, with a new opening formed to permit access over the adjacent garden. This glazed door permits light to flood the space, reorientating the spaces and creating a visual connection between the house and the barn. In front of the new entrance lies a small terraced area, providing a space that captures the warm evening light filtering through the trees. Elsewhere, existing openings have been retained, with new timber framed sash windows and oak doors provided. Internally, the new accommodation is a mixture of storage and flexible private studio / workshop space, transforming it into a useful annex to the adjacent dwelling. The nature of the building permits much of the existing stone to remain exposed internally. This is set against a palette of timber and stone reclaimed from the barn itself. New materials provide a contemporary contrast, including timber and steel trusses, unlaquered brassware and raw copper light fittings. Orchard Barn won an RIBA Design Award and the Regional Small Project of the Year Award at the 2018 RIBA East Midlands Awards.